"Nursery Capital of the World"
a city with a rich heritage and that "small town feel". Many of us grew up here…many of us chose to move here to raise our children, to work, or to retire…no matter the reason…we are living in a city with a rich heritage, surrounded by the diverse agricultural beauty created by many of our early residents. A legacy continued today by an expanding community of people as diverse as our agricultural roots. 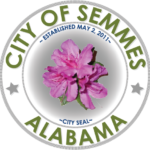 Semmes is a community with much to offer our residents, both young and old. So come and grow with us in Semmes, a city with a rich heritage and that “small town feel”. Copyright © 2019 City of Semmes Alabama. All Rights Reserved.